This hotel is located at the bottom of Buttermilk Mountain, Aspen's most family-oriented ski area, and is adjacent to the Aspen Skiing Company Ski School. Limelight Hotel is located 1 mile from Aspen Mountain and 3 miles from Buttermilk Mountain Ski Area. Aspen Highlands are 5 miles from this property. If you're looking for a great (and cheap!) hotel in Aspen (ski area), CheapTickets is the best place to find them. We offer deals on the best 186 hotels throughout Aspen (ski area). No matter what you're looking for, we have options for you. Grab great rates on the 99 affordable 3-star hotels that are easy on the wallet without sacrificing comfort. Looking for more luxury? Try one of the 30, 4-star hotel accommodations in Aspen (ski area). No matter your budget needs, we've pulled out all the stops to make sure you have plenty of vacation options. Maybe you prefer to search for your hotel deals based on what each hotel offers? For example, let's say you just want to find a hotel or resort that has a pool to cool off in after a long day exploring Aspen (ski area). Scroll down to choose from the 41 hotels in Aspen (ski area) that has a pool for guests. Or search for deals on Aspen (ski area) hotels offering free wifi or breakfast, non-smoking rooms, and more! CheapTickets is here to be your personal travel agent for your next trip to Aspen (ski area). Get booking today! What hotels in Aspen (ski area) offer free wifi access? Are there deals on Aspen (ski area) hotels offering free breakfast? Yes! The only thing better than finding a great deal on a cheap hotel in Aspen (ski area) is finding one that offers free breakfast. Grab some eggs, a waffle, or some healthy oatmeal before a day full of exploring Aspen (ski area) and all that it has to offer. Below are just some of the many hotels that offer free breakfast in Aspen (ski area). 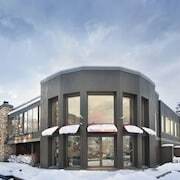 Independence Square Lodge by Frias is a 3.50 star rated hotel property in Aspen (ski area) that offers free breakfast. St. Moritz Lodge & Condominiums is a 2.50 star rated hotel property in Aspen (ski area) that offers free breakfast. 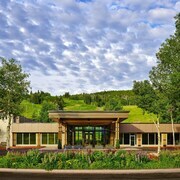 Molly Gibson Lodge is a 3.00 star rated hotel property in Aspen (ski area) that offers free breakfast. 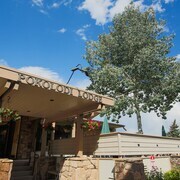 Pokolodi Lodge is a 2.50 star rated hotel property in Aspen (ski area) that offers free breakfast. What about deals on pet-friendly hotels in Aspen (ski area)? Aspen (ski area) is a great place to get outside and explore with your pets in tow so don't leave your furry friends behind. Below you'll find great deals on hotels in Aspen (ski area) that allow pets. Don't forget to bring plenty of treats! Snowmass Mountain Chalet is a popular, pet-friendly, 3.00 star hotel in Aspen (ski area). Viceroy Snowmass is a popular, pet-friendly, 4.50 star hotel in Aspen (ski area). 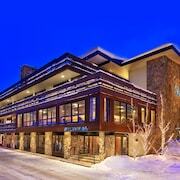 Aspen Meadows Resort is a popular, pet-friendly, 4.00 star hotel in Aspen (ski area). 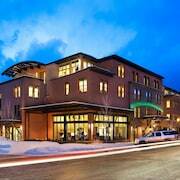 Limelight Hotel Aspen is a popular, pet-friendly, 4.00 star hotel in Aspen (ski area). Any good rates on Aspen (ski area) hotels with restaurants? Absolutely. Don't want to deal with planning our all your meals on your trip to Aspen (ski area)? We don't blame you. Keep the hangry away by staying in one of the 17 hotels that have restaurants. With a room at one of these spots, all it takes to get a good meal is hopping in the elevator. 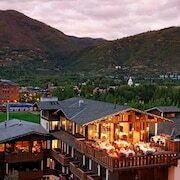 Check out some of the most popular hotels in Aspen (ski area) that have restaurants below. Book The Timberline CondominiumsThe Timberline Condominiums is a 3.00 star hotel and has one or more restaurant options. Book Inn at AspenInn at Aspen is a 3.00 star hotel and has one or more restaurant options. Book WillowsWillows is a 3.00 star hotel and has one or more restaurant options. 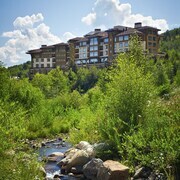 Book The Westin Snowmass ResortThe Westin Snowmass Resort is a 4.00 star hotel and has one or more restaurant options. What are the cheapest hotels in Aspen (ski area) with pools? What's better after a long day exploring Aspen (ski area) then a relaxing dip in a pool? Finding the Aspen (ski area) hotel you need for a bargain! Cool off and unwind at one of our 41 Aspen (ski area) hotels with a pool. Browse some of the top deals on these hotels and resorts with pools in Aspen (ski area) below, but be warned: You may not want to check out! Pokolodi Lodge has a pool and a 2.50 star rating. Villas at Snowmass Club- A Destination Residence has a pool and a 3.50 star rating. The Stonebridge Inn- A Destination Hotel has a pool and a 3.00 star rating. Aspen Mountain Lodge has a pool and a 2.50 star rating. What hotels in Aspen (ski area) offer parking for guests? Once you've made your way to Aspen (ski area), the last thing you want to deal with is finding parking close to your hotel. Avoid the hassle of parking around the block and carrying your luggage all the way to the lobby by booking one of our hotels with parking. Check out deals on some of the 47 hotels in Aspen (ski area) that offer parking for guests. Hotel Durant This hotel has a 3.00-star rating. Laurelwood- A Destination Residence This hotel has a 3.00-star rating. Hotel Aspen This hotel has a 3.00-star rating. Annabelle Inn This hotel has a 3.00-star rating. Do Aspen (ski area) hotels offer 24-hour concierge services? When you're on vacation, things don't always go according to plan. Travel with peace of mind when you book one of our 41 hotels in Aspen (ski area) with 24-hour concierge service. That way you know help is always phone call or elevator ride away. Try The Crestwood Condominiums. It's a 3.00 star rated hotel in Aspen (ski area) that offers concierge services 24 hours a day. Try Hotel Aspen. It's a 3.00 star rated hotel in Aspen (ski area) that offers concierge services 24 hours a day. Try Annabelle Inn. It's a 3.00 star rated hotel in Aspen (ski area) that offers concierge services 24 hours a day. Try Tamarack Townhouses- A Destination Residence. It's a 3.00 star rated hotel in Aspen (ski area) that offers concierge services 24 hours a day. What about low rates on non-smoking hotels in Aspen (ski area)? Hearthstone House This hotel has a 3.50-star rating. Hotel Jerome- An Auberge Resort This hotel has a 4.50-star rating. Aspen Mountain Lodge This hotel has a 2.50-star rating. What are the cheapest Aspen (ski area) 3-star hotel deals? Our 3-star hotels bring you quality accommodations at a lower price point for the perfect, budget-friendly vacation in Aspen (ski area). With 99 3-star hotels throughout Aspen (ski area) to choose from, you still have options. Browse our selection below. Molly Gibson Lodge. Located near the slopes, this Aspen hotel is in the mountains, within a 15-minute walk of Isis Theatre and Aspen Mountain, and close to winter sports such as skiing lessons and snow tubing. Buttermilk Mountain Ski Area and Aspen Highlands are also within 3 mi (5 km). Inn at Aspen. This hotel is located at the bottom of Buttermilk Mountain, Aspen's most family-oriented ski area, and is adjacent to the Aspen Skiing Company Ski School. Mountain Chalet Aspen. Located near the slopes, this Aspen hotel is in the city center, within a 5-minute walk of Wagner Park and Aspen Mountain, and close to winter sports such as cross-country skiing and skiing lessons. Buttermilk Mountain Ski Area and Aspen Highlands are also within 3 mi (5 km). Laurelwood- A Destination Residence. Located in the mountains, this ski-in/ski-out condo in Snowmass Village is within 1 mi (2 km) of Snowmass Ice Age Discovery Center and Snowmass Ski Area and close to winter sports such as cross-country skiing and skiing lessons. Anderson Ranch Arts Center and Snowmass Club are also within 3 mi (5 km). What are the best deals on 4-Star Hotels in Aspen (ski area)? Aspen (ski area) is full of hotels and it can be hard to narrow down where you really want to stay. Luckily, we've done that hard work for you be narrowing you from 186 hotels throughout Aspen (ski area), to the 30 4-star hotels in Aspen (ski area). Our 4-star hotels in Aspen (ski area) are exactly what you need for your next family trip, romantic weekend, or solo getaway. Check out our most popular deals below. The Westin Snowmass Resort: Located in Snowmass Village, Westin Snowmass Resort has ski-in, ski-out access to some of the best-rated ski terrain in Colorado. From winter skiing and snowboarding to summer hiking, outdoor activities and a cozy bar scene abound in all seasons. Aspen is a 20-minute drive away. Hotel Jerome- An Auberge Resort: Hotel Jerome is a restored 1889 Luxury Silver Boom Era hotel, 7 blocks from Aspen Mountain and the Silver Queen Gondola, provides airport and local transportation to guests. Limelight Hotel Aspen: Limelight Hotel is located 1 mile from Aspen Mountain and 3 miles from Buttermilk Mountain Ski Area. Aspen Highlands are 5 miles from this condo property. Viceroy Snowmass: Located in the mountains, this ski-in/ski-out resort in Snowmass Village is within a 10-minute walk of Snowmass Ice Age Discovery Center and Snowmass Ski Area and close to winter sports such as cross-country skiing and snowmobiling. Anderson Ranch Arts Center and Snowmass Club are also within 3 mi (5 km). old, run down, college dorm like hang out....the whole property needs visible maintenance. You get what you pay for on this deal. Great location (ski- in/out), walk to mall. Interior of unit was in avg condition but very dated. All staff helped put on skis and boots everyday which I have never had that luxury in the past. All staff were professional and helpful especially the concierge desk. Nice hotel, they were upgrading while we were there which was great but not so good for us, you can smell the paint as you walk through the hallways and hear banging while your in your room. I would go there again once they remodel and you don’t have to walk through paint smells and hear loud noises. Staff was very friendly and it’s close to everything! It was a great experience. I took my husband to Aspenwood as a surprise and we both loved it. Hotel is close to the slopes and mall. There is also free transportation.